Accidents will happen when you least expect them. Well, that’s what happened to me last Thursday as I was getting out of a taxicab that took me and my blogger friends home after an event that we attended earlier that day. I was sitting comfortably in the front passenger seat without the slightest idea that something terrible would happen to me. When the taxi stopped in front of the building where I live, I said goodbye to my friends and was out of the cab in no time. After I closed the taxi door, I suddenly lost my footing and down to the ground I fell. It happened so fast! 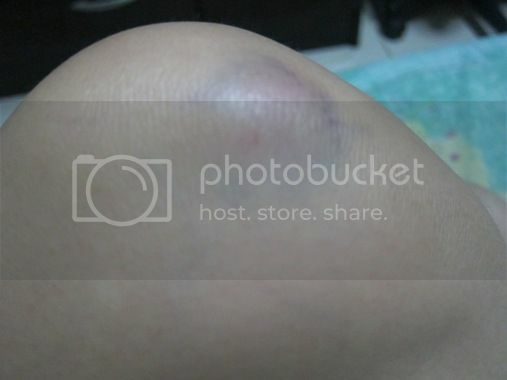 And this is what I got: a bruised knee! I’m telling you this was one nasty bruise. It was swollen and painful when touched. Not even the softest daybed covers could take away the pain, and I had to endure this for almost a week. I’ve also been experiencing discomfort in my right hand until now and if this problem persists, I have no other option but to go to the doctor to have it checked. Sigh! This entry was posted in Bruise, Bruised Knee, Fall Accident. Bookmark the permalink. ← Pensive Thoughts’ D-nee Baby Care Products Giveaway!